Why Should Entrepreneurs Pick up Meditation? Rising in popularity in recent years, ‘meditation’ and mindfulness seem to be the new buzzwords bouncing around on social media. As the number of people living the modern fast-paced city life, stress levels are rising. When not addressed and managed properly, stress can affect efficiency, productivity and focus as well as mental health more broadly. For entrepreneurs in particular, taking on the brunt of a business on your own can cause extremely high-stress levels. So to be a successful entrepreneur it’s vital to manage and combat setbacks to keep your business heading in the right direction. To help all entrepreneurs out there, we’ve compiled a handy guide with how to get started with meditation! The term meditation stems from the Latin word ‘meditatum,’ meaning ‘to ponder.’ The practice of meditation has been around for thousands of years, with the earliest records dating back to approximately 1500 years BCE. Taken on by various religions, it’s now come full circle and is heralded by celebrities, specialists and entrepreneurs worldwide. But what does it mean today? The popular meditation app Headspace describes the practice as ‘training in awareness and getting a healthy sense of perspective.’ Realistically it means whatever you want it to mean, underpinned by the ideal goal of gaining some mental space in your head. Crucially linked to mindfulness and modern moving meditation such as yoga, we are going to look at how practicing meditation can help you and your business. Entrepreneurial stress isn’t something to be ignored. While going it alone will be daunting, it’s easy to ignore stress until it becomes unmanageable. But practicing meditation as an entrepreneur, you may be able to implement it in the core company culture further down the line to ensure employee happiness and a fantastic working environment. By exercising the brain through regular meditation practice, scientific research supports the fact that we can build up areas of our brain. In doing so we can essentially rewire them to enhance positive traits such as focus and decision making at the same time as reducing negative ones like stress and fear. Read more about the benefits of meditation. How can it improve your business as an entrepreneur? So we know what it can do for your individual health, but what about your business? 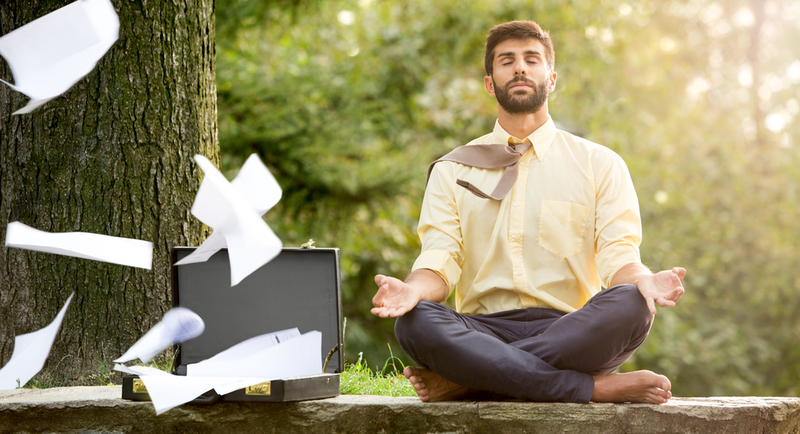 Many people say they don’t have enough time to meditate or practice self-care, but in actual fact by taking just ten minutes a day to practice mindfulness, your business can reap the benefits too. Learning to concentrate and shut off distractions taps into the great skill of improving focus and concentration. Ever notice yourself getting easily distracted by every movement, sound or vibration from your phone? Sometimes in order to be more productive, our brains need to slow down and combat tasks with more awareness and focus. Not only that, but meditation has proven benefits of increasing your creativity. Filtering through the daily sludge of your thoughts, creative ones can thrive and develop. Meditation also helps to communicate these ideas. As an entrepreneur, effective communication is key to efficiency and managing your emotions under stress really denotes someone who can be resilient when needed. Mindful meditation can turn stress on its head and facilitate greater success in the small things. If stress is becoming too much with mounting deadlines, check out how our Virtual Assistants can help manage your time and workload. Lastly, meditation promotes a positive outlook. As an adventurous entrepreneur you may experience tough setbacks, obstacles and failures. But by taking the time to meditate and re-envision these failures as learnings, you can maintain a positive outlook and keep moving forward. Facing too many failures? Maybe it’s actually time to outsource some work to a Virtual Assistant so you can concentrate on the bigger tasks at hand. Now we’ve demystified meditation let’s take a look at how you can apply it to your life, business and mindset. Zen Meditation – Similar to Mindful meditation but it goes a bit deeper. The goal is to breathe and mindfully observe one’s thoughts without judgement, simply noting the emotions that arise throughout. Still not convinced? Read about the 7 key types of meditation in more depth to see what might best suit you. Although we can describe and envision meditation, it’s getting down to it which might be the tricky part. We recommend easing yourself in with the use of a helpful mobile app. Two tried and tested examples are Headspace and Calm. Both have various programmes of guided breathing and meditation techniques to promote focus and concentration, slowly easing you into the full meditation practice over time. Whether you’re looking to improve your focus, enhance your sleep or simply gain some clarity of mind, taking up meditation might be the next step for you. But if your workload is proving unmanageable, why not apply for a free trial with a virtual assistant to see how they can help your business. With proven benefits to enhance your productivity, focus and efficiency, meditation is a win-win for anyone looking to sharpen up and increase their long-term capacity for hardship and obstacles in their personal or business lives.